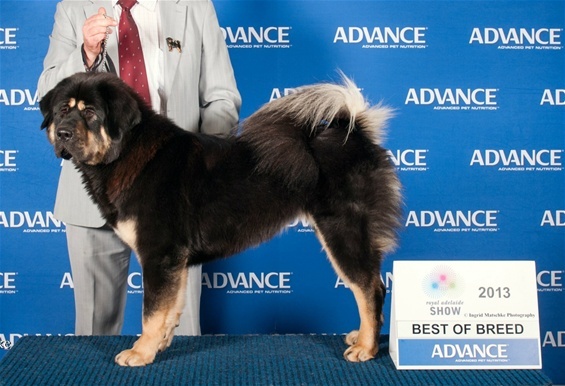 Bush Song Tibetan Mastiff Kennels was born out of love and respect for this majestic breed. The more I researched their background, the more in awe I became with their ancient history and various uses as dictated by man. The Tibetan was and is a fearless guard dog, used not only to guard flocks and villages, but also by the Tibetan monks as gatekeepers to their sacred temples. Hence the names Temple Dog and Gate Dog. Today we appreciate them for their loyalty, even temperament and companionship. Bush Song have a limited breeding program with the overriding aim to breed quality, well loved, true to type Tibetan Mastiffs. Bush Song TM's are nurtured and cared for with a great deal of time invested in producing well natured, healthy, happy puppies and adults. TM's are a part of the family and as such, spend a proportionate amount of time in the house both curious and involved in all day to day activities. Bush Song is a small hobby kennel in the Adelaide Hills with no intention of breeding dogs as a commodity for profit. We are entirely devoted to providing the best life our dogs can possibly have. We love animals, respect their rights as well as the environment and derive great pleasure from our TM's being a part of this idyllic lifestyle. The Bush Song brood consists of six TM's, four girls and two boys. Our girls are Bonnie, Hannah, Jade and Effie. Our tall boy is Argos and newest home bred Grand Champion is Jett. Bush Song tirelessly promote and show the breed and have been doing so since 2009 - both locally and interstate. Bush Song TM's come from Champion bloodlines and are Australian Champions in their own right. Along the way they have had many wins under many respected International judges including wins at Adelaide, Melbourne and Canberra Royal Shows. All Bush Song TM's from birth have been under the care of a vet, uniformly immunised, micro chipped, tested for bone structure and hereditary diseases to ensure they enjoy the best of health from puppy to adulthood. They all undergo puppy and dog training to ensure socialization and a temperament suited to being a family member. From time to time Bush Song will have beautiful happy puppies available to place in loving homes where the intention is to make their beloved puppy a part of their family. Please feel free to contact me to make a time to visit the Bush Song brood along with the other wildlife with which they share their home in the Adelaide Hills. I am always happy to provide information and answer any questions you may have. Like myself I am sure you will find that you can not be in the presence of such a majestic ancient breed and not be completely taken over by them. Falling in love with this breed will spoil you forever. Hi these dogs are amazing. Are there any puppies available this litter ? There is a waiting list for this litter. If you would like offer a home for a puppy from this litter then best to send me an email. email me - bushsongtibetanmastiffs@bigpond.com - and we can discuss how to make this possiible. Yep, one of these guys would make a great playmate and guardian, Would be devoted to both you and your 4 legged friend. Email me to discuss. Do you have any idea when you may have a new litter in 2019?